We Apologize…there appears to be something wrong. The Association for the Blind provides benefits and services to visually impaired Lowcountry residents. The new Vision Rehabilitation Center provides in-home instruction to help partially sighted clients preserve their independence by managing daily routines. The association also offers eye care to low-income residents, computer training on assistive software programs for legally blind individuals and social and recreational events. For more information, call Gwen Bouchie at 843-723-6915 or visit www.associationfortheblindsc.org. Founded in the 1790s as the Charleston Orphan House, the Charleston Youth Development Center assists some 600 Lowcountry youngsters each year in reaching their full potential as healthy and well-adjusted individuals through residential programs, along with Big Brothers Big Sisters, emergency shelters and Horizon House Clinical Day School Program. In addition, the CYDC’s Bakker Career Center helps these youngsters transition to work, community and adulthood with meaningful careers. For more information, call Barbara Kelley Duncan at 843-266-5200 or visit www.cydc.org. Catholic Charities’ mission has expanded in the past few years from simply offering emergency assistance with utility bills and rent to holding medical and vision clinics once a month and providing free dentures. The agency’s special program for senior citizens provides such services as food, prescription medicines and a memory support group. For more information, call Helen O’Leary at 843-308-9361. The Charleston Leadership Foundation (CLF) was founded in 2002 to bring together local Christians to minister to the community and change lives. 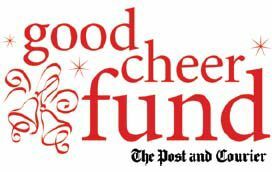 Now, through the Good Cheer Fund, CLF will be answering prayers for physical needs in our community as well. In addition to the partnership with the Good Cheer Fund during the holiday season, the CLF sponsors the annual Charleston Leadership Prayer Breakfast each fall offer a morning of prayer, music, and worship. Answering prayers by answering needs. For more information. Contact: Kathryn Krogh | email: krogh@clf1670.org | phone: (843) 471-0101 or visit: www.clf1670.org. The Lowcountry Food Bank is working to eliminate hunger in the 10 counties of coastal South Carolina through programs such as the Kids Cafe (an afterschool feeding and mentoring program for at-risk children) and BackPack Buddies (a program providing healthy snacks to children suffering from inadequate weekend nutrition). The agency also provides food for distribution by other area charities and packs up boxes of nutritious food for some 3,000 seniors during the holidays. For more information, call Jermaine Husser at 843-747-8146 or visit www.lowcountryfoodbank.org. For more than a century, the Star Gospel Mission has been ministering to the poor and homeless of the Lowcountry. The organization provides transitional housing for up to 25 men needing a helping hand to start a new life. The mission also offers financial emergency assistance to the community and distributes clothing, toys and food vouchers at Christmas. For more information, call the Rev. Bill Christian at 843-722-2473.